The Texas Heeler is a hybrid dog that is bred by crossing a Blue Heeler (a.k.a. Australian Cattle Dog or ACD) with an Australian Shepherd (or Aussie). They're a popular hybrid dog in the state of Texas. This breed is coveted by farmers, ranchers and others that enjoy rural living and outdoor adventure. We will take a look at the characteristics of this breed, followed by some detailed information on both parent breeds. At the end of this article we will help you decide if this designer dog breed is a good fit for your lifestyle! Australian Shepherd and Blue Heeler Mix: Is the Texas Heeler right for you? Texas Heelers are loved for their herding instincts, which is not surprising since both parent breeds are exceptional members of the herding group. Many have excelled both as working dogs on Texas ranches, as well as in sports such as agility, flyball, herding and obedience. These alert dogs can be possessive of their family and tend to be somewhat suspicious of strangers unless properly introduced. They can be good guard dogs, particularly since they are unlikely to bark unless they sense a threat. These crossbreeds need plenty of exercise and do best when they have a job that they can focus on. They tend to be loyal to their family, however, they can be wary of other dogs and pushy with small children. Both of these tendencies should be considered before adopting or buying one of these canines as a family pet. With both parents in the top of the intelligence spectrum for canines, there is no reason to expect a stupid Australian Shepherd Blue Heeler mix. They respond well to positive training methods, but can be somewhat stubborn. Strong leadership will be important if you expect this hybrid dog to thrive. Both parent breeds are medium stature dogs, so you can expect the same from this mix. Expect an adult dog somewhere between 25-50 lbs., and about 17-22” tall at the withers. Males are somewhat larger than females, although both tend towards a stocky and athletic build. 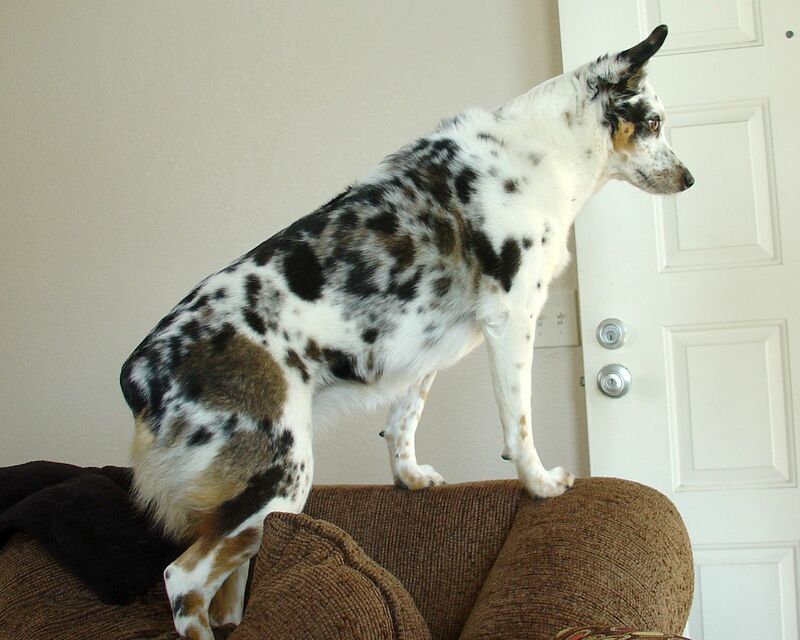 Texas Heelers tend to have the shorter coats and specked features associated with ACDs, however, this is not always the case. They also are sometimes born with the medium length coat that many Aussies have. Likewise, the tan markings that are typical of many Australian Cattle Dogs are common in Texas Heelers. Blue or red speckled is the most typical color pattern on the body and legs. Ears can be pointed or floppy, although the former is more common, giving this mix an alert look. In rare cases, the different colored eyes that can be found with Aussies will also appear with the ACD and Aussie mix. 12 -15 years is the average life expectancy of this hardy breed. Like all dogs with merle color variations, higher rates of deafness are to be expected. Other potential congenital problems common to both breeds include progressive retinal atrophy, hip dysplasia and epilepsy. Unlikely to be much of a barker, unless left alone too much or persistently under stimulated. You can expect an intelligent dog that is relatively easy to train with positive training methods and strong leadership. This is an excellent hybrid dog for sports such as agility, obedience and herding trials. You will be hard pressed to find a better ranch hand than this crossbreed, accounting for their popularity among Texas ranchers. Relatively easy grooming needs with weekly brushing and a yearly blow-out. In some cases, these hybrids do not do well with other dogs, particularly if not socialized well as puppies. Both parent breeds have extremely high exercise needs. The ACD has a reputation for being somewhat unpredictable with small children. ACDs can be somewhat stubborn. Strong leadership from an experienced dog person is highly recommended. Also known as the Australian Cattle Dog (ACD), Red Heeler, or the Queensland Heeler, this canine is a popular member of the Herding Group. Known for their tenacity, trainability, intensity and loyalty, it is little surprise that this is a popular breed in both Australia and the United States. The Blue Heeler is a breed that originated in the very challenging climate of the Australian Outback as an aid in cattle herding. Early stock used in the foundations of the breed included a variety of dogs. Smithfield: a stocky, black herding breed from the British Isles. Dingo: Australian native wild dogs, added to enhance endurance. Blue Smooth Highland Collies: Added in 1840 by Thomas Hall, to temper the rather aggressive and loud heelers. Bull Terrier: Added in the 1870’s to increase stockiness. Dalmatian: To add the love of livestock and loyalty to human handlers this breed is widely known for. Black and Tan Kelpie: To reinfuse the breed with a strong working ethic and the characteristic tan markings typical of ACDs today. A tendency to be possessive. ACDs commonly have issues with resource guarding. Sometimes these dogs can be aggressive with other dogs. Early socialization is key. Height: 18-21” for males and 17-19” for females. Blue: This color includes blue, blue mottled or blue speckled. Black, blue and tan markings are accepted with tan markings on the legs and jaws. Red Speckle: Even red speckling with some allowance for even head markings. Deafness and blindness are congenital problems that can occur. The nickname for this popular and lovable breed is simply the “Aussie.” They have consistently ranked among the top 20 dogs in the USA over the last 5 years, according to the AKC. The Blue Heeler and Australian Shepherd mix likely owes much of its popularity to this beloved breed. Ironically, this breed was developed from a variety of different herding dogs by ranchers in the Western United States, not Australia. The exact foundation breeds that resulted in the Aussie we know today is largely unknown because of poor record keeping. It is likely, however, that dogs who herded sheep in the Basque region of the Pyrenees Mountains had a strong influence on the stock. It is likely these dogs came to America with their human companions from that region, who happened to have stopped for a short time in Australia on their way to the States. Despite the fact that the Australian Shepherd Club of America was established in 1957, it was not until 1993 that the AKC formally recognized the breed. Like the Blue Heeler, the Aussie is a dog developed for herding. They are happiest when they have a clear job to do and have a chance to excel. ​This is why so many lovers of the breed find themselves gravitating to dog sports like agility, obedience, herding trials and flyball. The Aussie does have the advantage of being a little less intense and prone to neurotic behavior as a family pet than ACDs. They tend to be a bit less serious, more willing to try on new behaviors, and prone to seek out fun games to get their owner’s attention. They are very intelligent and train willingly, particularly with positive training techniques. They tend to be good with children, although they are sometimes cagey with other dogs so be sure to socialize early and often. There is a significant difference between males and females of this breed, both in height and weight. They have a solid build and medium stature, but loads of grace and agility. These athletic dogs are rivaled in agility only by their distant cousins, the Border Collie. Some breeders are now breeding selectively for size. Keep your eyes peeled for miniature and toy Australian Shepherds coming soon. Blue merle, black, red merle, and red (white or tan markings allowed in restricted areas of the body). Because points of contrasting colors are allowed, many Aussies have tri-color markings. The top coat is of medium length and can be wavy or straight. This is a double coated breed, so an undercoat is also expected. However, it will be climate that largely determines the thickness of this downy bottom layer. One of the more distinguishing characteristics of this breed, and part of their stunning good looks, are their often uniquely colored eyes. Australian Shepherds carry the gene for heterochromatic eyes, in other words, they are often multicolored. Shades of blue and brown cover the spectrum from light to dark. Even a single eye may have several colors! The average lifespan for the Aussie is 13-15 years. Eye problems, hip dysplasia, and epilepsy are the more common congenital problems that tend to show up in this breed. However, it is overall considered a healthy and hearty breed. If you would like to share your experience with a Blue Heeler Australian Shepherd mix, we welcome your comments below! I have a girl named Dixie. She is without a doubt the smartest dog I have owned. She is very loyal, and good at picking out bad people. She knows her left from her right and loves her frisbee. I love her to death. She is 8 years old and has been a blessing all the way through. She is my better half! It’s insane how intelligent these dogs are! If the puppy is raised from a young pup with a cat, it can work, right? I’ve read that if they’re raised seeing the cat(s) as a member of the family, they won’t see them as prey. More often than not that’s the case. Early socialization is certainly key! Bandit (my pup, almost 1 year old) has been raised with two cats. He doesn’t see them as prey, more as squeaky toys. He often doesn’t want to let them pass, pinning them, but he has never harmed them. He just wants to play. 1 1/2 years ago, I “re-homed” a Texas Heeler at 3 1/2 years old. The original owner had a toddler and the dog would play too rough with the child. He has become the most loyal, smartest, and agile dog I have ever known. He thinks that catch and retrieve with a ball is a contact sport if you don’t watch him and imitates hooked tarpon when catching a bounced ball. Generally, he’s good with kids if they don’t have a ball in their hand. Not a day goes by that he doesn’t make me smile. I’m very glad you both found each other! We’ve got a blue heeled and she is really good with most dogs (she gets reall snippy with dogs that are bigger than her), and the family cat. I’ve never had a dog that is so alert and seems to be constantly playing. We got her from a shelter and had no idea what type of dog we had until the vet told us. I would gratefully appreciate anyone who has ideas about training and and things I can do to to help her busy through out the day. We take her the dog park 2 times every day. She’s not a dog to lay around. She will come and cry at me when she’s bored. I’ve got a blue heeler cross too, that was also a rescue from a shelter and is also a bit nervy around bigger dogs, bet they would love each other though. Swear he’s smarter than me sometimes! For training I would use a combo of food rewards and play rewards (eg if she sit, stay and lays down she gets to play tug of war with you). Try to teach her the fundamentals of loose lead walking and impulse control, it will go a long way. I’ve got a dog walker that comes and takes my dog out 3 times a week, another option might be to see if you could look after another person’s pup at your house during the day so that have each other to hang out with, otherwise interactive toys like kongs, raw bones etc gave give them something to do for a little bit. 🙂 sounds like a dream upbringing for pooches the world over! I adopted my Texas cattle dog from a family (relatives) who should have had a cattle dog! I got him at 11 months and I had 2 older dogs and 2 cats. With daily no nonsense walks with the other dogs and daily training, he learned to accept cats as a disliked members the family. What I find interesting is that though I have had him for over 6 years, he goes crazy over his original family when they visit. 🙂 Loved the ‘disliked members of the family’ part. I think with most dogs, and especially cattle, they love whoever they meet when they’re pups. They think so optimistically at that age! Kookaburra is the smartest dog I have ever known. He’s red heeler and red merle aussie. We live in a city. He learned to not cross streets unless I say so .. to not chase squirrels and rabbits (cuz they do cross streets) He seldom wears a collar/leash .. He grew up with a cat and never starts fights with other dogs. I have conversations with him ! Best Dog Ever. Amazing and love the name Kookaburra (I’m Aussie so a bit biased). Thanks for sharing! We just picked up a little girl her name is River. She is an Australian shepherd cross Red Heeler. She is very beautiful. We have only had her two weeks and she is for the most part house trained. The odd time she will have an “accident “ but it’s usually when I’ve left her for short periods of time, as if I’m mad at you mom. She knows sit with just a hand command. She stays close and loves her three boys. We live on a farm with 50 alpacas. She has been coming into the barn with us each night and watches closely. She has an older brother named slim who is a min pin with a human personality. I’ve always had labs or Danes growing up so this is new to me but I love her so much already! She is so smart and sometimes too smart it seems. But as she gets bigger she will have animals to herd. She has been good with the cats, except one. She got hit by the cat and now growles at the cat every time she see it. We go on walks all over the farm and she loves to be side by side Slim or myself. I find she already listens to me more than anyone else. If they tell her to come she runs the other way. If she could be outside rain or shine she would be 24/7! She sounds amazing Jess! I bet she looks very unique too, the Red Heeler x Aussie Shepherd wouldn’t be too common! My Bubba was dumped and immediatley took up with me.. hes vwry protective of me, my 7 year old son and very much his home.. he has became an important member of our fam. Great with visitors unless he senses a bad person then he lets us know and always been point on with his insrincts .. he has a for ever home now as part of our familey..
She’s very lucky to have you then! Thanks very much for sharing! Riley was 10 weeks old when I got him. I really didn’t want a dog, especially such an energetic one, because I’m 70 years old, and not active. But, my son, who lives with me did, and he thought I needed a companion, since he works out of town 80% of the time. LOL, Riley has become “my dog” since he spends almost all of his time with me. He is the smartest dog I’ve ever met. I taught him 9 tricks and commands the first two weeks! And, we love our daily walk in the park. Its good for both of us. At home in the yard he will run like the wind! I just love this smart, funny and affectionate little guy! We got our half blue healer…half australian shepard about 3 mos. ago. She was just 12 week. She is so hyper! Always wanting to play rough wit our 15 year old weinie dog…Ozzie.. She…Peggy Sue….is beautiful….but she is a nut farm. She is so hard headed. We do love her soooo but just curious….do they stay this crazy and hyper or will she eventually settle down a little . Either way…..we’re all in. We just want her to be happy and have a great life! Every dog is different but I would be confident she will calf down in time. You have a very active working dog on your hands though so plenty of exercise is needed which would help make her behavior better. So glad to have found your page! I have a true Texas Heeler…until now I didn’t know what that Blue Heeler/Aussie cross was called. We rescued her at 14 mos while living in TX – so makes sense! We had a cat and 4 kids at the time – many calming massages and acclimation to the family and she’s been our best girl ever, since! Same as someone else said. chases the cat and pins him down sometimes, but they drink from the same bowl and pretty much ignore eachother. I’ve notices his uneasiness with toddlers for sure – and larger dogs as well, but she just prefers to keep to herself when in their presence. One funny thing is that on walks when we pause for any reason, she’ll look at us and bark to tell us to keep going. She’s 7 now and comes everywhere we can bring her. She’s laying beside me at work right now! Thanks again and take care! I’m glad you like my site! Hi we have a blue heeler Aussie Shepard mix aka Dottie, great dog, smart as a whip. Playful needy and prances like a show horse. My question is, she got along great with my other dog pug Boston terrier mix aka Nina, but now they can’t get along at all. Nina is fixed Dottie is not both females, nina is 6 Dottie 2 years. If we get Dottie fixed will the correct the problem or will they forever have to be separated.. I miss the times where they played together and even slept together. Thanks for sharing. The problem could be fixed, I definitely recommend getting a dog trainer in to assess the situation first hand. We got a Texas Heeler (Evie) and an Australian Shepherd (Nita) as puppies in 2017. They were cousins and born about a month apart. Evie loves fetch and Nita loves her bones and playing keep away from Evie. We did not socialize them very well as puppies with other dogs and now we are running into two issues a year and a half later. They have terrible separation anxiety when they are separated for a few minutes for a walk or to go to the fenced area one at a time, or when we go in another part of the house that they can’t come in for 5 minutes (but are fine when we or the other pup leaves for long periods of time for work, outings they can’t come on or long trips where one stays home with mom and the other leaves with dad). The second issue is that they tend to act as though they are going to kill any other dog or cat that they see. We have never let them get close enough to see what would actually happen, but they do the same thing to strangers on the street until they get up near them and then they start shaking their little tailless butts and just want affection. We are experimenting with separating them and taking them to one on one play dates with other dogs to socialize them now, but wouldn’t dare try the dog park again. Last time, their initial attacking personality attracted all of the large dogs to get aggressive too before we even got in the gate. They are so intelligent and sweet with people. We love them so much, but want them to be able to have friends and be able to take them places without the fear of a dog fight, or God forbid, them actually getting aggressive with a stranger and being forced to put them down. I’m at a loss here for what to do other than take them on separate outings more often, slowly socialize them and hope for the best. Does anyone else have any ideas or thoughts on these subjects? Thank you in advance for your input! Thanks for sharing your situation. My only advice is to get a qualified and trusted dog trainer in. I’ve got no doubt that your pups behavior can improve dramatically, a good dog trainer will assess both dogs individually and together and be able to provide you with a plan that will slowly improve them over time (think 12 months commitment). He is such an intelligent dog, we have a cat who he does like to fight with, it’s play fighting most of the time and my kitten usually starts it but sometimes it gets a little rougher than a ‘mom’ would like but no real damage and he’s learning to get better. We are currently in the middle of an insane barking issue, he barks at everything and nothing too, I get him out every day a few times a day to try and socialize but he barks viciously at everything, kids, adults, other pets, I know he is still young and just finding his voice as such but does anyone have any experience with this kind of behavior? I don’t want him to completely lose his sense of guarding because I love how he’s my protector but when a 6 year old asks if he can pet my dog, I really want to be able to say yes! I think the play fighting with your kitten could be a good thing so long as they don’t get hurt, it helps build bite inhibition (soft bites, they’ve learned to moderate the strength of their bites through play with their brothers etc, super important factor in the socialization of any dog). It’s really hard to gauge the barking and protectiveness without seeing it first hand, so I’d suggest getting a dog behaviorist in who can work with you and provide a plan moving forward. I discovered my Diggy (Aussie/Heeler mix) one morning when I opened my front door and he was rolling around on my front porch. After taking him to my vet to check for a microchip, I learned he was approx. 14 weeks old. I tried for over a month to find his owner, but he had no chip and I couldn’t find any kind of notices online, posted signs or info at shelters in regards to this baby. About 4 weeks later, my Rotti mix Austin very suddenly became ill with an auto immune disease and crossed the Rainbow Bridge. I also have a Black Lab mix and Cattle dog mix, but it is Diggy who has made me laugh and has helped me through the loss of my 11 year old boy Austin. I decided that he was already in his forever home and there was no need to try to find him one. I am amazed at how smart Diggy is, this boy is brilliant! He gets along with my other 2 dogs and will chase, but not hurt my 2 cats. He is also very much a snuggle bunny and loves to sleep snuggled against me or snuggled up to one of the other dogs. I was blessed to have this special boy show up on my porch! He amazes me more every day with his intelligence and loving nature! We have a 1year 8 month Texas Heeler that we adopted at 5weeks old. Dad was chocolate Aussie & mom was Blue Merle Heeler in GA. He is an inside pet with a sister cat. His energy needs are meet by hiking, swimming, walking & yard agility set up. Inside he has stuffed animals & balls to heard & play with…he almost plays soccer with the balls. He loves to travel, is an excellent swimmer, obeys & appears to actually have a sense of humor. Reuben is his name & he never ceases to amaze us with his understanding & intelligence…love this guy! Hi! I just got my Australian Shepherd/Blue Heller mix and had a couple questions. During the week, we walk her in the morning (about 4-5 am) have someone paid to come and walk her midday, and then we walk her again when i come home (3-4 pm). Is this enough excercise? We also let her play out in the yard as much as she likes when one of us is home, and she has plenty of toys. I have one of these fur baby s she is very head strong will she outgrow this.If not I still love her she is my baby. Hello! I am so excited to say that we will be getting our Texas heeler on November 18th. I have two nephews and a niece, all under 5. I spend a lot of time with them and I imagine our pup will too. They all have big dogs, labs and boxers, who hey play with all the time. The lab specifically a hunting dog who is way too strong, haha! If I closely monitor there actions with our pup, do you think that will be okay? Hi. Any Texas Heeler pups in PA? Kiko is a male rescue miniature Australian Shepherd/Blue Heeler. He came to us after he was abandoned by his family at 7 months old. We have a 10 year old female Labradoodle, Piper, who lost her sister earlier this year and has been depressed and not eating much since that time. We brought other dogs into our home, the neighbors pets to see if she would like companionshpip but no one was a fit. That is, until Kiko. We brought him into our home and he worships Piper, treats her like a queen and mimics her behaviors. He attempts to get the old girl to play and on occasion she will join him. He is smart, a loving lap dog and just wants to do the right thing. We are in love as he has been such a great addition to our family. Wow, Laura! Your post’s description is similar to the problem I have been experiencing, since Hannah passed away last January, with my last pup “Kalie.” Hannah came to me at around 7-8 months of age from an OK oil rig. The people who found her thought she was an ES field dog – ES of Dallas, TX, contacted me and I drove to OK to pick her up and discovered she was not an ES puppy, but a breed I could not ID. ES wanted nothing to do with her, but she was home. Broken rear leg, crushed pelvis, brown tick fever, and mange. She was a mess but stoic. (Hard – Headed, to say the least.) Vet ID’d her as an Australian Shepherd/Queensland Heeler. He had to remove her tail because of the pressure on her spin and pelvis, but he got her up and moving after nine months of care. In her “hay day” Hannah oversaw up to 12 dogs, protected 3 acres of land and saw me through cancer and the loss of the Alpha Male pup. At age 14, Hannah let me know it was time and it was the hardest thing I had to do. After 13 years with us, Hannah left one pup behind. “Kalie,” who has been confused, insecure and afraid after Hannah’s passing. Kalie was 12 years old on Hannah’s passing and she is still in mourning – no matter what I do, a year after Hannah’s death. How did you find Kiko? I own a healthy 12yr old female Australian Cattle Dog Shepherd mix. She has a beautiful medium long hair coat, mixture of gold, brown, black and white. She is shedding a lot. Every spring the groomer cuts/shaves her coat. However, the vet warned me if we have her coat shaved this year, it may not grow back due to her age. Is this true? ?